House for sale near teresa antipolo taytay ortigas 7k/mo! ...11k/mo. TERESA Single House (10 mins fr. Antipolo) 1.8M only 10k/mo. BARAS (near Morong, 10 mins fr. Teresa) 570,000 – 1.3M as low as 3k/mo. Commercial Lot with Improvement Maysha Hotel, M... Quezon Avenue, Brgy. San Isidro / Sto. Niño, Angono, Rizal"
Residential Vacant Lot Village East Subdivision, San Roque, Angono, Rizal (TD under previous owner) "
House and Lot Blk 27, lot 1 and 2 Dahlia corner Carnation daffodil, Primerose Hills Subd. 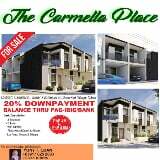 Mahabang Parang Angono Rizal"
Residential House & Lot Lot 36, Block 75, Road Lot 11, Village East III Subdivision, Brgy. San Roque, Angono, Rizal"
Residential Vacant Lot Lot 14, Block 12, Main Road, Village East Homes II, Brgy. San Isidro (Muzon), Angono, Rizal"